We are seeing unprecedented change in industry dynamics and understanding how companies respond is critical for investors. In this visual education tool, we set out our proprietary, fundamental research process including the five factors that we believe help identify potential changes in earnings outcomes. 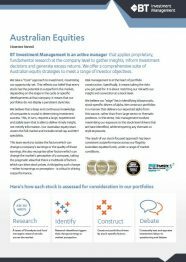 Crispin Murray, Head of Equity Strategies, shares the team’s outlook for Australia’s economy and equity market. BTIM provides its latest insights into the FY17 annual reporting season, offering a deep assessment of underlying market trends and the implications for investors.